We set to work to solve his material handling safety problem from our unique perspective. For more than 20 years, Adrian’s Inc. has created solutions for cargo containment in rolling stock under the Bednet® and Freight Saver lines. Our design focus has always been to create effective, simple devices that work on the truck as it sits; regardless of the variables. Applying this same philosophy to rack safety, we developed an inexpensive solution that installs with no tools, no retrofitting and no additional hardware. 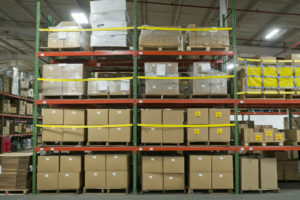 One person can install an effective pallet push-through prevention system in seconds. We still get questions, but they are mostly rhetorical. And these days, they often start with “wow”.